It’s no secret that social isolation is a huge problem in Metro Vancouver, especially since the Vancouver Foundation published its June 2012 “Connections and Engagement” report quantifying the extent of the issue. And although Vancouver has a reputation for being a place in which it can be difficult to make new friends, the problem isn’t just local. British coppers made headlines last year for having a cup of tea with a senior who had been driven by loneliness to make a call to the 999 emergency line. Community building: A New Year’s Resolution for all? Love ’em or hate ’em, adopt them or not, thoughts of new year’s resolutions are on most people’s minds each year when the calendar reaches its final days. As we know, most well-intended resolutions die a quick death in the first few weeks following January 1. But surely it is still worth taking the time to look ahead at the year to come and ask yourself what you’d like to bring to it, and get from it. Rice Lake rink a rare treat! 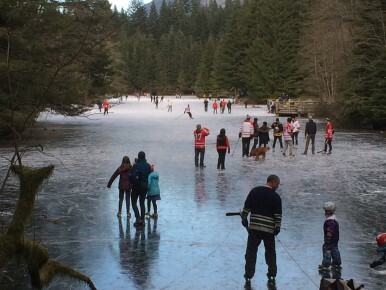 Even those of us who have lived in Lynn Valley most of our lives don’t have many “back in the good ol’ days” stories about skating on local waterholes. The small ‘swamp’ off of McNair Drive in Mountain View Park would very occasionally freeze over enough to provide a destination for a few skaters, but there wasn’t room for many, and ‘skating’ was probably an over-generous verb to use to describe the experience of shakily navigating between the branches and logs frozen into the muddy ice. Win a romantic evening for two! Celebrate a fun Valentine’s night on the town, close to hearth and home! Start by enjoying a $50 dinner for two at the Black Bear Pub (they’ve promised their most romantic candlelit table! ), then carry on to Friday Night Live’s “Love to Laugh” show, featuring dance music from The Sharp Five jazz band, hilarious improv from Ad Libretto, and refreshments – including a chocolate fountain! P.S. Psst! 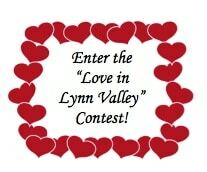 FYI, the prize must be accepted as awarded – all the fun to take place on the evening of February 14, 2014! It’s been fantastic travelling around Lynn Valley and seeing more and more sunflower patches out in full bloom. Perhaps they are showing up more now, thanks to the backdrop of our recent grey weather! Some of our own flowers are still to emerge, and others are drooping. But just because their petals may no longer be perky, don’t forget that your sunflowers are far from finished. For many creatures, the best is yet to come! Well, I’m very glad I planted my Project Sunflower seeds out in mid-May, because ever since then – between Lynn Valley Days and end-of-term festivities and grad and visitors – there has certainly been no chance for much meaningful gardening. Fortunately, Mother Nature has been doing all the work, and most of my seeds have turned into fine young plants, many of them now over a foot tall. I need to thin out the ones in the garden bed; although sunflowers don’t prefer to be moved, I am hoping some will transplant into neighbours’ gardens. This was going to be a celebratory post about the fact that my sunflower seeds poked their heads above the soil last Saturday, a scant week after I detailed their planting in this post. For the past two months, the LynnValleyLife team has been planning and promoting its scheme to blanket Lynn Valley in summertime sunflowers. We’ve talked sunflowers, mailed sunflowers, photo’d sunflowers and dreamt sunflowers. It occurred to me that amidst all the fuss, I might forget to actually plant the darn things! These first sunny days of almost-spring make me realize how cabin-fevered I had become! There are still a few weeks ’til spring officially kicks in, and an even longer haul ’til we get some reliable, lasting warm weather, but in the meantime it feels like some small seasonal celebrations are in order. It was a wet, slushy night and our band gig down at the Lynn Valley Village Christmas Tree Walk had been cancelled. I was looking forward to a night in front of the fire, but life, of course, had other plans and at 4:30 p.m. 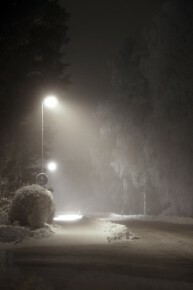 I was instead trudging exasperatedly down the dark street to help my son look for his lost wallet. When I caught up to him, though, he wasn’t looking for the Canucks wallet that had fallen out of his pocket on the way home from school. “I’m helping this kid find his sister,” he explained, gesturing to the solemn-looking boy beside him.